The stars of the art world are usually seen as bad boys with tattoos, piercings, and all the clichés of popular romance. McRay is no cliché. He is an original. He is neither the starving artist nor the profiteering commercial artist. “I am an extraordinary gentleman with an adventurer’s heart, but I’m no bohemian!” He is a man that has struggled throughout his career to achieve a high level of technical proficiency, pictorial intelligence and a sense of artistic legacy. 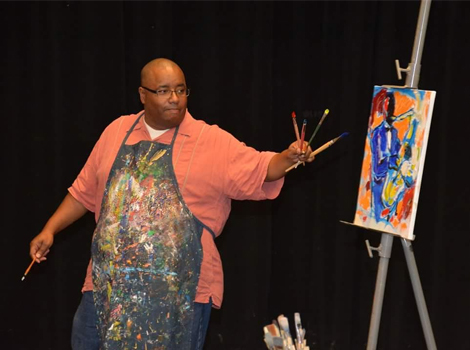 McRay received a BFA degree at the Maryland Institute, College of Art, where he earned a four-year scholarship for his artistic talent. A native of Washington, DC, McRay moved to North Carolina and has been exhibiting since 1987. In November 1998, he was juried into Raleigh’s prestigious Artspace. Since opening his Artspace studio in downtown Raleigh, McRay has served in the offices of Vice-President and President of the Artspace Artists Association, as well as served on Artspace’s board of directors and Executive Committee. McRay’s artistic career has been featured on TV and radio programs, and in numerous newspapers, magazines and websites. The Raleigh News & Observer named him one of the “Artists to Watch”. Numerous times he has been listed among the “Best Local Artist” and “Favorite Local Artist”. McRay has received feature articles in Fortune Small Business, Art Business News, Our State Magazine and Southern Living Magazine. Some of his collectors include the SAS Institute, American Tobacco Campus, North Carolina Central University Art Museum, Duke University Medical Center, Duke Health Raleigh Hospital, NC State University, UNC – Chapel Hill and Western Wake Hospital, as well as many private collectors locally, nationally and internationally. Also, McRay was privileged to participate in the Art in Embassies Program, which displayed his works in the US Embassy in Copenhagen, Denmark.